Stockyard has been around for over 40 years; you can see it on the Pike as you are driving east to Cambridge. It was bought by the new owners in 2013, but this was my first visit so I can not tell you from experience if it is that different. From what I've read, they have only freshened up the fixtures but have not changed the layout, or the menu much. They have labeled it as a “Classic American Tavern,” but it reminds me of Frank’s in Cambridge. Steve and I had a dance lesson on Thursday night and our dinner choices were dictated less by deliciousness, but more by available parking due to all the snow. Stockyard has 150 car parking lot, making it the most attractive option in the area. Our lesson was at 7:30pm so when I arrived first at 6pm, I let our waitress know I was ready to order for the two of us. She was too efficient, and our meals arrived before Steve did. Our waitress was very sweet and offered to take his steak tips back to the kitchen to stay warm. Luckily, he arrived 10 minutes later and we wolfed down our food, starting with the rolls that were crusty on top, but tender, like a Parker House roll, on the inside – very nice. 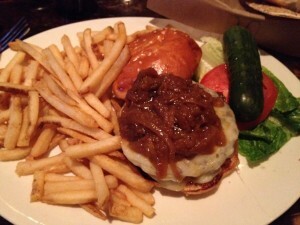 I got the Stockyard burger with cheddar ($14) and added caramelized onions ($1); it was huge and was a structural disaster that was a mess to eat. The patty slid off the right off the onions and the soft bun. The meat was cooked medium rare, but didn't have much beefy flavor. The fries were fine. 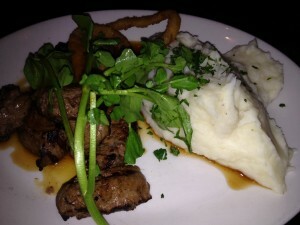 Steve enjoyed his steak tips ($20), and it came with a mountain of mashed potatoes. After we paid the bill, I realized our lesson it was at 8:15pm, not 7:30pm. Steve made me admit my mistake to the waitress and he ordered a glass of wine. She recommended a glass of Super Tuscan ($12) and he really liked it. 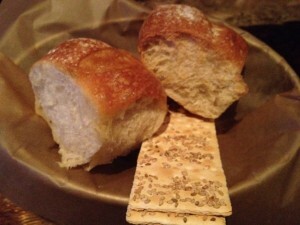 The stockyard was a solid option, with decent food and a really nice, accommodating waitress. The prices are a little high, but it is worth it for the parking.